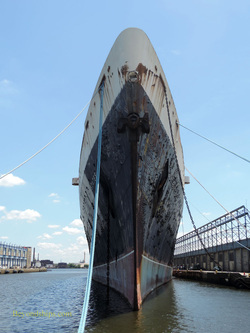 The SS United States has always had admirers and as the retirement years dragged on many became concerned about the ship's future and banded together to campaign for her preservation. Indeed, former President Bill Clinton agreed to be the honorary chairman of one of these groups, the SS United States Trust. In 1999, various groups interested in preserving the ship were successful in having the United States placed on the National Registry of Historic Places, the official federal government listing of places that are worthy or preservation. While listing does not ensure a place's survival, it is prestigious and indicates that the destruction of that place is not to be done lightly. One of the most active of the preservation groups was the SS United States Preservation Society, which was founded in 1992. An offshoot of that organization is the SS United States Conservancy incorporated as a non-profit organization in 2009. When Norwegian Cruise Line announced that the SS United States was for sale, the only entity that expressed an interest in buying the ship that was not looking towards her scrap value was the SS United States Conservancy. 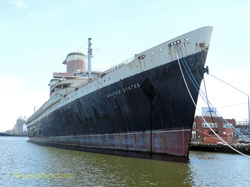 Although it had received an offer of nearly$6 million from scrappers, Norwegian decided to sell the ship to the SS United States Conservancy for $3 million. Coming to the rescue was Philadelphia philanthropist H.F. “Gerry” Lenfest who donated the bulk of the funds needed to make the purchase. The purchase was completed in February 2011. Even though the SS United States was now owned by a preservation group, it did not mean that the ship was saved. It cost $60,000 a month just to maintain the ship as is where she was. While Mr. Lenfest had also donated enough money to pay these costs for 20 months, it was clear that time was of the essence in developing a plan for redevelopment and a permanent home for the ship. Despite seeming insurmountable obstacles, the Conservancy has thrown itself into the task of saving the United States with passion. It has instituted a grass roots fund-raising campaign. To aid in that campaign, it has published an interactive website https://www.savetheunitedstates.org/ where viewers can “buy” (i.e. sponsor) a piece of the ship. It has also undertaken a campaign to build public awareness of about the SS United States. This has included making a documentary about the SS United States for public television and creating exhibits for New York's Forbes Galleries and Philladelphia's Independence Seaport Museum. The Conservancy has also promoted international media coverage of the plight of the SS United States. Not waiting for a long-term solution to somehow drop in its lap, the Conservancy has been meeting with developers in New York, Philanderer and Miami exploring options. Meanwhile, the Conservancy has begun work to make the ship more attractive to prospective developers. This has included removing tanks and other items that will not be needed when the ship becomes a static attraction. A byproduct of this work is that the unnecessary items can be sold for scrap and thus contribute to the fund-raising effort. In June 2014, the Conservancy received a $120,000 donation from cruise industry executive Jim Pollen along with a pledge to match up to $100,000 in other contributions. However, even with these additional funds, the need to find a permanent home for the SS United States remains urgent.